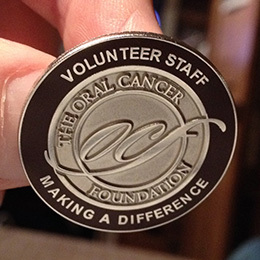 As a nonprofit organization, the Oral Cancer Foundation relies on the dedication and support of volunteers who selflessly donate their time, talent, and energy to help us achieve our mission of reducing the death rate from this disease through public awareness and early detection. This page will provide you with links to the OCF Regional Volunteers and related events in each of their geographic areas. You may contact the foundation directly at this link –volunteer if you need additional information, would like to participate in OCF actively by becoming a registered OCF volunteer, or if you have a group that would like to co-sponsor an event with the Oral Cancer Foundation. OCF conducts awareness and early detection events with dental schools, universities, hospitals and other health and patient related organizations. We also cooperate with a diverse group of private organizations that wish their club or group to be involved in contributing to charitable events. Groups as diverse as runners and cycling clubs, to scouting and church groups can participate to help raise awareness and the early detection of oral cancers. We welcome partners who share our values and desires, and who wish to make a difference in the world around them through active participation in charitable events with The Oral Cancer Foundation. 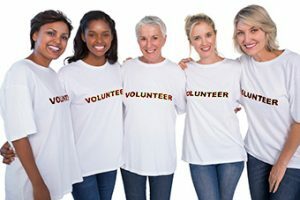 Volunteerism—whether through online forum participation, through educating the public, or through fund-raising efforts—can be an emotional healing agent, distracting oral cancer survivors, patients and caregivers away from lurking depression, giving them a cause to focus on. Volunteerism is also a bridge-maker, drawing diverse community members together, spreading awareness and opening minds and hearts. Volunteering definitely has been a benefit for me,” says survivor Barbara Boland of Philadelphia, Penn. “I have this other focus. I can say ‘Now I have a goal: I’m going to work on improving the five-year survival rate, help people to be diagnosed earlier.’ It helps me avoid the whole ‘Why me’ side, the depressive side. Boland recently rallied her family members, co-workers, colleagues and friends to raise $15,000 to give toward a walk-a-thon staged in support of the Oral Cancer Foundation. The Walk for Awareness, produced by another survivor, cheer coach Minnie Ashworth of Chesapeake, VA, was held there in mid-April of this year. Ashworth, long steeped in the spirit of volunteerism, took on the challenge of producing the walk-a-thon not only to raise money, but to raise awareness about a disease that, despite its staggering toll, flies low under the public’s health-knowledge radar. The task was daunting: Ashworth had never produced a fund-raising event. But with help from her family, fellow survivors, and her doctors, Ashworth managed to stage not only the fund-raising walk, but an oral-cancer screening event as well. I would guess there were 80 to 100 people in attendance with all of them getting oral screenings,” Ashworth says. “Daniel Karakla and Trad Wadsworth, my doctors, were there to do screenings along with Dr. Betsy Hagan, associate dean for clinics at the VCU School of Dentistry. Those who battle or have already fought oral cancer, as well as their caregivers, often find themselves in a similar crusade. Among them is Daniel Bogan of Kaukauna, Wisconsin, who took a four-week break from chemotherapy so he’d be strong enough to participate in the Walk for Awareness, is a devoted advice and support giver on the Oral Cancer Foundation’s web based Survivor/Patient Forum, a place where those who are newly diagnosed can candidly talk with individuals who have been down the treatment path before them. We don’t offer medical advice, since we’re not doctors,” Bogan stresses. “But we can offer our experiences… many of the issues that come up with oral cancer can be emotional in nature, many can be related just to the desire to know that you are not alone in what you are experiencing. In these areas, survivors can play an important support role. Information and encouragement from fellow survivors and patients helps those newly diagnosed or undergoing treatment weather this most challenging period of their lives. Once they’re through treatment, many “graduate,” and themselves begin volunteering their time, effort, and emotions to others in need of encouragement. Boland, a dental practice management consultant, previously worked as a dental hygienist, has an advantage over much of the general public: she knew about oral cancer. And she knew that when an abnormality cropped up in her mouth, it wasn’t something she should ignore just because she wasn’t a textbook case of a person at risk for the disease. I got oral cancer without having any of the risk factors,” Boland says. “I never smoked, I was not more than a social drinker, and I was age 41 at the time of my diagnosis.” Boland was one of the lucky few who are diagnosed at Stage 1. She credits her own persistence. But she, Bogan, and Ashworth, who all devote hours of time to the Foundation’s patient/survivor forum, all volunteer in the hope that in the future, Stage 1 diagnosis will be the norm, rather than the exception. Besides participating on the Foundation’s interactive support board, Ashworth produced the Virginia Walk for Awareness. The effort to save even one person from going through what they’ve experienced is what keeps these volunteers moving forward. The foundation encourages others to become engaged in the effort to raise public awareness, and encourage the development of an annual oral cancer screening program in professional offices, such as dentists ENT’s, hygienists, and other medical professionals. Your contribution might be as simple as helping produce content for the web site, to write letters to people who may be in a position to help the foundation, to raise funds for the foundation’s efforts, or even put on a walk or screening event in your community. The possibilities are endless for those that have a passion to help others. And the ideas that have helped are very diverse. A father and son hike a long mountain trail for days to raise money in memory of a grandparent. A youth dance troupe puts on a recital event to raise funds for an awareness program. A motorcycle club rides to raise awareness. A group of professional musicians put on a concert to raise funds and public awareness. A bachelor auction in 2006 raises $7,000 to help OCF print awareness and information brochures. And these are only a few of the ideas that volunteers have come up with. You too could be part of making a positive change in the world. Contact the foundation. It will change your life, and that of others… perhaps even save a life.